I've been really inspired to do some decluttering lately. I'm refreshing myself on the KonMari method and trying to really turn our home into a relaxing, calm and clean environment. Clutter is killing me and if I could just get rid of everything at once and repurchase new things, I would. But since that's not possible, I need to declutter what we have, sort through things and decide what stays and what goes. It's amazing the effect clutter can have on your mood. Living in a clean and clutter free environment actually reduces my anxiety and makes me feel more productive. It's rare that I feel like this though, which tells me that we have a lot of work to do around here. I feel happy when the house is clean, but I want to take it a step further with the KonMari method. In our house, we have 4 places that we keep Toiletries. FOUR. That's too many, and I'd like to narrow it down. 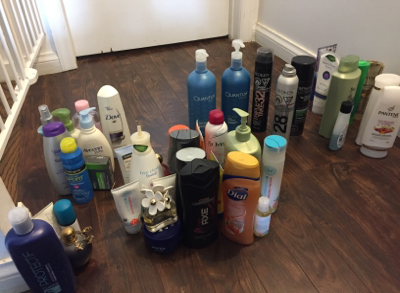 Currently we keep toiletries (hair products, lotions, soaps, etc) in the shower, on the shelf in our bathroom, in our linen closet, and under the sink. I want to eliminate the bathroom shelf clutter, and only have current items that we use in the shower, and spare items under the sink or neatly stored in the linen closet. I made a pile for keep, donate, and throw away. I didn't end up throwing away as much as I would have liked, but we can always go back and reevaluate what we've used in a couple of months. The KonMari method encourages you to keep items that spark joy in your life. This is difficult to do with items like this because while most of them don't make me particularly happy, they are necessary. I'm happy to be clean and have products that keep my family clean and smelling good, but it's not a joy sparking kind of situation. 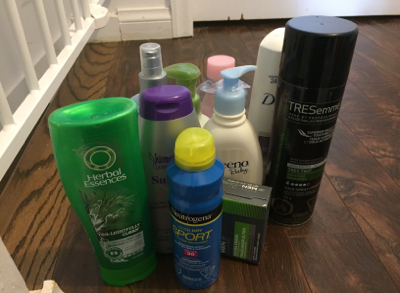 We had a lot of extra products that my mom has given us, like extra shampoos and soaps. I also have some huge bottles of shampoo and conditioner that I got as a gift and haven't used yet. I honestly haven't had to buy shampoo on my own in years because of the stock pile we somehow keep accumulating. I decided to keep the items that I KNOW we will use within the next few months. I also kept my favourite perfumes, sunblock that doesn't expire for 2 years, and some of my son's lotions and creams that we currently use on a regular basis. - New, unopened Johnson's baby lotion because we don't use that brand and someone else could get some use from it. - Full bottle of baby oil- we have never used baby oil on Mason and have no plans to. - Almost full bottle of Herbal Essences shampoo because although there is a lot left, I don't like the smell. - Sunblock because I don't like using spray sunblocks and someone else might be able to make use of it. - Purple Shampoo, because I don't have highlights anymore and my mom could use it. - A new in box bar of men's soap because my husband doesn't use bar soap, he uses body wash. I plan to make up a box for the men's shelter during the holidays this year, so this will be something I can include. - A new bottle of beach wave spray that I won't use because I straighten my hair. - A full can of hairspray, because I have 2 other full cans that I prefer and will be keeping. - A full bottle of conditioner that I liked the smell of, but just won't use any time soon because I have so many other bottles I prefer. - Taylor Swift Perfume. I had a really hard time deciding to get rid of this one. It was Valentine's Day gift from Mitch from like 5 years ago. I loved it so much when I first got it, and it obviously has some sentimental value to me. I haven't worn it in forever and I tried it on today, and the scent isn't the same as it used to be. Over the years the scent has broken down and it's not something I would wear now. It's still half full, which shows that I probably stopped wearing it 6 months or so after he got it for me, and it's not something I'm going to reach for again, so it had to go. My current favourite is Daisy by Marc Jacobs, which I actually use on a regular basis. 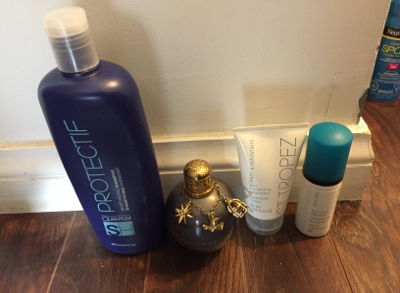 - St. Tropez lotion and tanning foam. This is almost empty now anyway, and self tanners hate me, so it has to go. So, that's it. I know it looks like we are keeping a lot, but it will all be used within a few months time. I'm happy to get rid of the stuff we won't be using. I'm going to store the extra products in our linen closet in a basket, so it's not right out in the open on our bathroom shelf. Eventually I would like to get even farther into the KonMari method by removing labels from products. Having tons of products with all different labels creates visual clutter and can increase anxiety. I'm not going to literally remove labels from products- instead I'll be buying clear bottles for shampoos and body washes, glass jars for laundry detergent, etc and labelling them with a simple, small black and white label. That way everything will look clean and streamline, and it will be the same products, just in a nicer package. I'll be making more posts soon as I KonMari other things in our house.